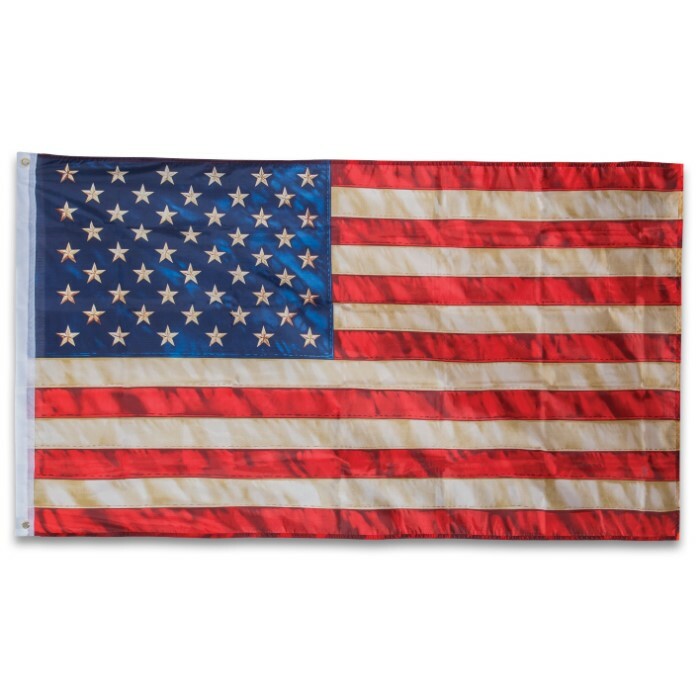 Distressed Look American Flag - 3' x 5' | BUDK.com - Knives & Swords At The Lowest Prices! Show your American pride with a flag that looks great waving in the breeze or on the wall of your man cave. This Distressed Look American Flag is 3’ x 5’ and features bright, vivid colors that are dye sublimated on high quality polyester for colors that won’t fade. It has metal reinforced grommets for easy hanging on a pole, on the wall of your garage or off the back of your bike at a rally. Decent price. Flag is ok looking but does not look anything like the picture. Picture appears to be an embroidered flag and actual one is printed. Show that you're a proud American and what better way than to fly this flag. Well made flag at a decent price. The description doesn't mention the fact that this flag is not red, white, and blue. The stars and stripes are actually yellow and not white. This was a bit of a surprise when I got it. But the flag looks very nice.